Seriously, I’ve always wondered what happened to these guys. If anyone knows, please let me know. Better yet, if you have pictures of what they look like today, send them in. 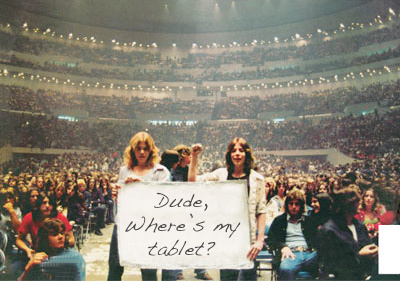 Free fake tablet to anyone who sends in photos that can be verified. Bonus prize of a free fake Verizon iPhone if you can get these two guys to stand next to each other and pose just like this. » Apple is way ahead of the crowd.